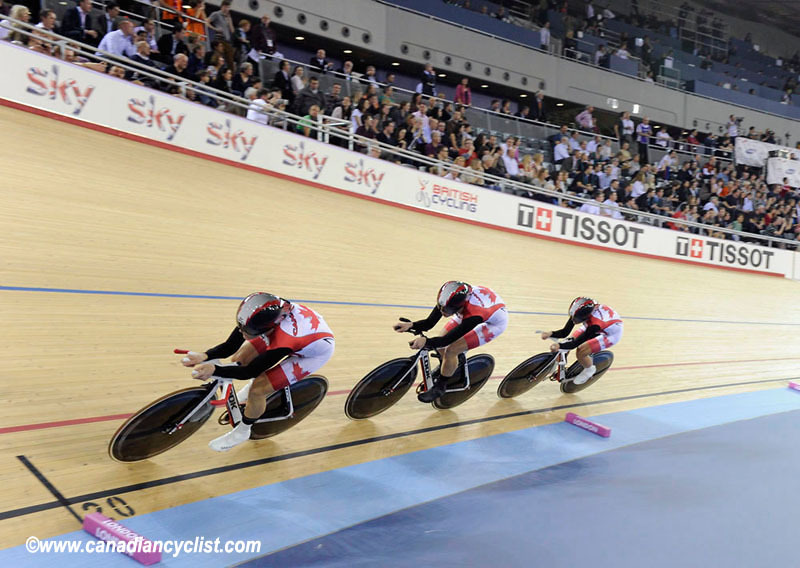 The Canadian Women’s Team Pursuit won the silver medal at the 2012 UCI Track World Cup, also dubbed the Olympic Track Cycling Test event, in London tonight, breaking once more the Canadian record which they had set just yesterday in the qualification round. The day after posting a remarkable fastest time in the Qualification round, Canada’s Women’s Team Pursuit team of Tara Whitten of Edmonton, AB, Jasmine Glaesser of Coquitlam, BC and Gillian Carleton of Victoria, BC posted a time of 3:18.982, a new Canadian record. The previous World Record [3:19.569, set May 2010 in Mexico] was to be eclipsed 3 times on the evening. First by Team Australia in the Bronze medal round who set a time of 3:19.164, then by the defending World Champions from Great Britain who won the gold medal, and in doing so set the newest World Record with a time of 3:18.148 on this very fast track. Gillian Carleton, a 22-year old rookie on the National program hailing from Victoria, BC, was thrilled about the mark. What’s more remarkable about Gillian’s performance is that she rode the team pursuit for only the third time at the international level, and only her second race with Glaesser and Whitten. “Anytime you ride under the World Record, you can be pretty happy. Setting a new Canadian record on top of what we did yesterday was absolutely fantastic. The British girls ran a great race, setting the new World Record, so I think we were in great company,” commented Gillian, the current Canadian Championship title holder in the Women’s Team Pursuit [Roorda, Brown, Carleton], 2008 and 2010 Provincial Time Trial Champion [BC] and 2009 Canada Games Road Race champion. Gillian is competing at her career-second World Cup, and is completing the recovery of a fractured pelvis, which she broke during a crash in the Points race. Gillian went through five weeks of bed rest over the holiday period, before successfully completing a rehabilitation plan that was set up by the Canadian Cycling Team’s medical staff. “I only started track cycling last summer. We were very thrilled to qualify first and accomplished exactly what we were here to do. We came in to today’s race with pretty much no stress, no pressure whatsoever. We just wanted to have a good ride, and show what we are capable of doing, and we certainly accomplished that objective,” added Gillian, in a post-race media interview. 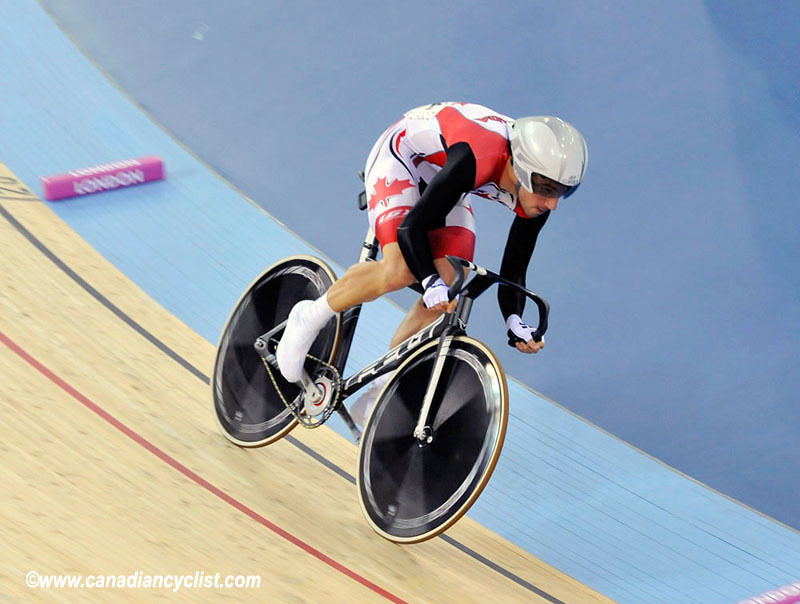 Zach Bell, Canada’s strongest Omnium competitor, opened the six-race, two-day event in style, posting the fastest time of the men’s 250m flying lap, an impressive 13.295 seconds. Bell later went and placed 11th of the men’s points race, and 14th in the men’s elimination race. Midway throughout the event, Bell sits in 5th place, with three more races to go tomorrow. Bell, the 2011 UCI World Cup Champion, is taking part in his second World Cup race of the season as he opted to focus his energy on training instead of travelling to World cup events in Kazakhstan and Beijing. Canada’s Men Team Sprint squad comprised of Stéphane Cossette, Hugo Barrette and Cameron MacKinnon, are still fighting for that Olympic spot. In today’s race, the trio posted a time of 45.513 seconds, less than one second behind the Canadian record, to finish in 13th place. Today’s performance was the first race together for the trio of sprinters. The team took part in a training camp, and the final selection was decided earlier this week. 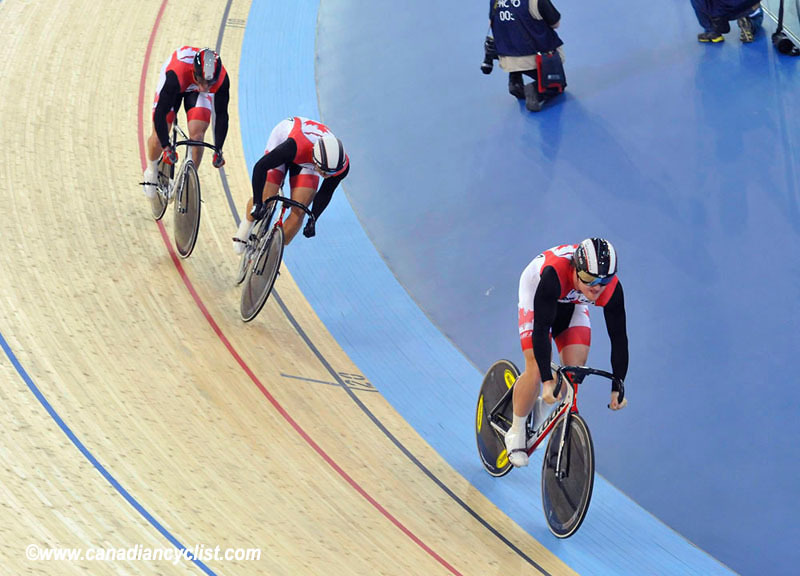 In an intense battle with Venezuela, which placed in 17th position today, Canada’s Olympic journey for the Men’s Team Sprint squad now turns to the 2012 UCI Continental Championships, held in March in Mar Del Plata, in Argentina. At that event, the team will have to impose itself against the team from Venezuela.